These happy little cookie bites are sure to produce post-dinner smiles. Good texture. They are crispy, as the label indicates. They are slightly crunchy as well, but "crispy" is indeed the proper adjective to describe the level of tooth/cookie resistance present in these snackable treats. They're made with oatmeal, which is better for you than bleached wheat flour, and they have a moderate amount of chocolate. Just enough to make them dessert-like and fun. 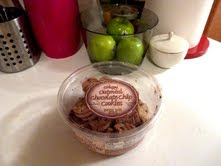 I'd say they're better than Famous Amos or any other big name vending machine type cookie, and probably better for you. And, if you broke down the price to find out the cost per cookie, I'm willing to bet they're a better value, at $3.99 for one package. Sonia gives them a 4 out of 5. I do, too. Bottom line: 8 out of 10. I picked up a free things at TJ's today based on your recommendations. These and the Pomegranate Green Tea were a couple of them, both are very good. These little cookies are crisp and have a surprisingly nice flavor, not like bland like some of the other little cookies I've tried from other stores.